Unlike the eastern Arctic, the western Arctic consists largely of islands, with the Canadian and Nordic mainlands a far, far smaller portion of the overall land area than Siberia. Where Russia’s islands were small, remote, and uninhabited enough that they were unknown to anyone prior to Russian and Norwegian exploration, the Arctic islands of what is now Canada, Greenland, and the Faroes were identified and settled thousands of years earlier. Still, their oppressive cold and relative remoteness kept them out of human hands until 6500 BCE, long after warmer places like Africa and Europe had seen empires come and go. Thanks to icecaps and forbidding mountain ranges, human settlement rarely penetrated past the coastal strips of these places, was often restricted to their southernmost edges, and relied on sea travel across icebound straits and Atlantic storms, or Inuit dogsleds, to maintain contact between settlements. Much like the South Pacific, this kept the western Arctic settlements extremely isolated from one another. The first inhabitants of the Canadian Arctic were the people the Inuit call Sivullirmiut or Tuniit, “first people,” and that archaeologists call the Dorset. As they appear to have lacked a writing system, it is not known what they called themselves. Arriving in North America around 6500 BCE, the Sivullirmiut arrived as far as the northwestern coast of Greenland in 2500 BCE. The Sivullirmiut were not “proto-Inuit,” and their technology and social structure appear to have been quite different from that employed by the Thule or Taissumanialungmiut people who did later become the Inuit. In particular, the Thule people developed boats and spears strong enough to enable them to hunt right whales, allowing them to expand from their apparent origin point in northwestern Alaska in 400 CE to western Greenland in 1200 CE, eliminating the Sivullirmiut as they went except for one spot. From the opposite direction, the Norse people arose in modern Scandinavia, at the juncture of the three modern states of Norway, Sweden, and Denmark. Beginning in 793 CE, they began a concerted campaign of raiding and settling known as the Viking Age, which spread Viking settlements all around the Baltic Sea, Great Britain, along the Volga River in Russia, and even into the Mediterranean. Expanding westward, they arrived in Iceland in 874 CE, Greenland in 980 CE, and the Faroe Islands sometime between. In the Faroe Islands, the Norse encountered small settlements of Irish monks, who were rapidly absorbed; similar encounters may have occurred in Iceland as well. In Greenland, the Norse settled the southwestern tip of the huge island, while the Sivullirmiut kept to their northwestern home and the late-arriving Thule taking the space between them. The Greenlandic Sivullirmiut disappeared within 100 years of the Thule arrival, though the Greenlandic Thule did not expand into their former territory and it would remain uninhabited until resettled by western Inuit in the 19thcentury. The Norse settlers on Greenland, who appear to have traded with the Thule, themselves disappeared in the 15thcentury under somewhat mysterious circumstances, most likely related to the Little Ice Age and the resulting impoverishment of their diet and loss of contact with their Icelandic kin. Despite the Thule’s near-certain destruction of the Sivullirmiut, there is no evidence of large-scale violence between the Thule and the Norse. Either way, just as European exploration of parts further south began in earnest, the Thule/Inuit of Greenland had their island to themselves, and would remain its sole masters until 1721. In the 16th century, Denmark (via Norway) sent missionaries to convert its colonials from their original pagan faiths or earlier-imposed Catholicism to Lutheranism, at which time it discovered that the Norse colony on Greenland, unlike the ones in Iceland and the Faroes, was gone. Resistance to the Reformation was strongest in Iceland, but Lutheranism has since become the majority religion of all of greater Scandinavia. At the same time, Britain asserted its sovereignty over the northern extremes of North America de facto in the Treaty of Utrecht (1713) and de jure in 1859 with the placement of the “North-Western Territory” in Hudson’s Bay Company jurisdiction, but this still did not include real control over the humans of the islands north of the mainland. Greenland, Iceland, and the Faroes were assigned to Denmark at the Treaty of Kiel in 1814, where the new state of Sweden kept what are now Norway and Finland. European whalers moved into the islands and mainland west of Greenland, establishing whaling stations and taking whales at such high rates that nearly all species would become endangered within a century. For the Inuit of what is now Canada, the combination of the loss of a primary food source in an unforgiving environment, European diseases, and the establishment of a permanent European presence in their homeland severely reduced their numbers even before Britain or Canada claimed formal jurisdiction over their territory. Traders interested in fox furs in particular entered into exploitative arrangements with Inuit that, thanks to the radically different organization of economy and society between the two groups. This led to the further erosion of Inuit family groups and hunting techniques and steadily increasing problems with alcoholism and violence. Many Inuit fled to northern Greenland, a migration that continued until 1864. In Iceland and the Faroes, longstanding local assemblies (the Icelandic Althing and the Faroese Logting) were removed around 1800 and replaced with Danish-imposed equivalents, to be restored in advisory capacities in 1843 and 1852. Greenlandic equivalents were established in 1862-63, merged into Northern and Southern Landstings in 1911 and into a single legislative body for the entire island in 1951. Denmark’s new constitution in 1850 established seats for Icelandic and Faroese (but not Greenlandic) representatives, as well. This coincided with efforts to promote the Danish language throughout the realm, to local resistance in all three locales. The Hudson’s Bay Company possessions (Rupert’s Land and the North-West Territory) were transferred to Canada in 1870, and Canada further extended its claim northward, over what would become known as the Canadian Arctic Archipelago, in 1880. The fortunes of all three Danish colonies waxed and waned with the North Atlantic fishing industry and, in Iceland’s case, ongoing volcanism in the geologically volatile region. Boom periods encouraged the idea that none of the three regions depended fundamentally on Denmark, and that all three could make a go of independence in the right circumstances. Iceland did the most to realize this possibility, signing the Act of Union in 1918. This act guaranteed Iceland as an independent state joined with Denmark in a “personal union,” with the possibility of revisiting its terms in 1943. The Inuit regions of Canada had no such income, their resources instead traveling south, and remained comparatively disorganized and subject to Canadian control. Inuit-majority regions would be divided between existing and new Canadian provinces and territories thereafter, the wishes of the Inuit not being considered until many decades later. World War II changed many equations for the western Arctic. The German occupation of Denmark created the widespread concern that the Danish Arctic possessions would become German bases, in extremely opportune positions for attacks on Canada, the United States, and the United Kingdom. Denmark sold its Caribbean colony to the United States outright; it became the United States Virgin Islands. Britain occupied Iceland and the Faroe Islands without a fight and used both as air bases against Germany. The United States assumed de facto hegemony over Greenland during the war, establishing an Air Force base at the town of Thule (now Qaanaaq) in extreme northwest Greenland. Anxious to bolster its tenuous claim to the islands north of the American mainland, Canada began relocating Inuit from the southern parts of their territory to the High Arctic islands. By stocking the extremely sparsely populated region with Canadian citizens, it could prevent them from being legally occupied by Germany or Russia—and remove “problematic” locals from regions of greater interest to southern fishermen, whalers, hunters, trappers, miners, and loggers. In Greenland, Iceland, and the Faroes, these wartime occupations effectively (if temporarily) severed Danish control over them, providing all three with the closest approximation of independence they had experienced in centuries. Unfortunately, only one of the western Arctic states would leverage this experience into full independence. In 1944, Iceland held a four-day plebiscite on the matter of independence, with 97% voting in favor. Iceland became a fully recognized independent state later that year. The Faroe Islands held a similar referendum in 1946, again getting a majority in favor of independence, but Denmark rejected it on the grounds that 66% voter turnout was not sufficient to justify such a radical move. The Faroese did, however, get recognition of their flag, autonomous “home rule,” and the use of Faroese in all Faroese matters except as needed to maintain collective proficiency in Danish as a second language. Greenland and the Canadian Arctic would take a slower path. The United States offered to buy Greenland from Denmark in 1946, but Denmark declined. Instead, Denmark began examining the possibilities for addressing Greenland’s isolation and dependence in 1948, and gave Greenland representation in Danish parliament (Folkting) in 1953, a century after Iceland and the Faroes had achieved the same. In the same decades, the appearance of major national-defense installations in the Canadian High Arctic led to new congregations of Inuit, who accumulated around such sites to seek out work, medical services, and trading opportunities increasingly lost to them with the collapse of whaling and fur-trading enterprises, contrasted brutally with the Inuit forcibly relocated to the same regions. The Inuit would not force Canada to reconsider their situation properly until talks began in the 1970s, which eventually led to the creation of the territory of Nunavut in 1999, a majority-Inuit territory whose government structure was explicitly created in Inuit terms. Elsewhere in Canada, Inuit in Quebec achieved a (Nunavik) Kativik Regional Government in 1978; the western Arctic Inuit managed an Inuvialuit Settlement Region in 1984; and Labrador got their own autonomous region, Nunatsiavut, in 2005. These three regions remain part of their prior province or territory, unlike Nunavut, but still afford a measure of autonomy to their constituents. Of all the native peoples of North America, the Inuit are the most likely to eventually have sovereign, independent states built on their terms. The Inuit homelands have the unusual combination of being both remote and coastal, the former preventing their wholesale settlement from outside, the latter allowing them to be connected enough to the rest of the world to function as independent states anyway. Only the Canadian Cree even come close to this level of possibility, though indigenous groups slowly gain influence in existing Latin American states as well. With that in mind, it’s both fitting and unsurprising that the Greenlandic Inuit are as close as they are to actually achieving national self-determination. Thanks to new mining and industrial possibilities and a location that will only become more opportune as the world warms, Greenland stands a real possibility of becoming well-off enough to shed its Danish subsidies within a generation and become the first internationally-recognized Inuit state. 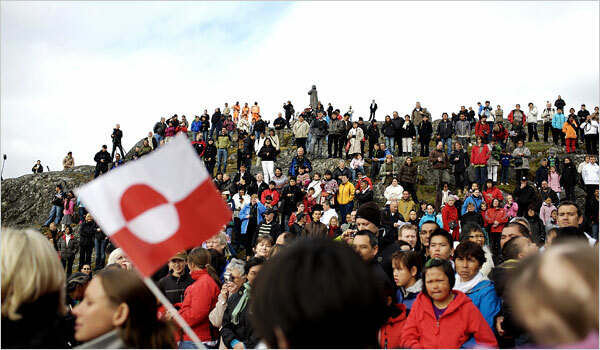 To that end, the Greenlandic people continue to reevaluate the role of the Danish language and regional Inuit dialects that may or may not be distinct languages in their own right; their relationship to Denmark and the rest of Europe; and their relationship with other Arctic peoples and states. An independent Greenland is unlikely to renew its long-discarded connection to the European Economic Community by trying to join the European Union, and will find a different relationship with North American states enticing. The airport in Nuuk recently established direct flights to Iqaluit, the capital of Nunavut, creating the possibility of far stronger links between the Canadian and Greenlandic Inuit than have ever before existed. This route also enables a potentially dramatic pivot in Greenlandic foreign relations toward North America, as virtually all air travel between Greenland and other countries previously had to pass through Copenhagen, a long, costly, and bizarre detour. Greenland’s success raises questions for the Inuit of Canada. Nunavummiut, Nunatsiavummiut, Nunavimmiut, and Inuvialuit prospects are far less enticing at the moment, thanks to a massively more exploitative history than the Kalaallit’s. The Inuit of Canada have had their history forcibly taken from them by the residential school system, and they have had their economy stolen from them by the near-extermination of the baleen whales and the abandonment of the fur trade and other later substitutes. Those trying to build an Inuit society in Nunavut face a far more daunting task than the establishment of the Landstings in Greenland: rejuvenating an economy that will never resemble what it was before centuries of European upheaval, for better or for worse, and building modern political institutions and electronic amenities in a country the size of Mexico but with 1/100 the people and far, far less funding. That task, and slowly claiming the rest of the power that Ottawa maintains over the distant territory, is the Nunavummiut’s work now, as it was the Kalaalliit’s work a few decades ago. Nunavut’s leaders watch Greenland’s past and present as an example to follow, creating the real possibility that Nunavut will seek independence of its own as its fortunes grow. Another possibility, annexing the continental Inuit to Greenland and creating a pan-Inuit state, is not especially realistic just yet. Greenland’s position, while continuously improving, is not nearly as strong as it would have to be to pull its neighbors out of their difficulties. More particularly, the remoteness and isolation of the icebound north has made sure that the Inuit are not a single people, but a continuum of tribes and dialects. Greenland’s standard Kalaallisut is demonstrably different from the two other dialects spoken in Greenland, Inuktunand Tunumiisut, and these in turn are not the same as Nunavut’s Inuktitut and Inuinnaqtun, Inuvialuit’s Inuvialuktun (itself a complex of dialects), or Nunatsiavut’s Nunatsiavummiutut. Linguists currently debate whether most of these should be regarded as distinct languages or as regional variations on a common Inuktitut, but they are all nonetheless the accepted and increasingly standardized vernaculars of different regions with different histories (Nunatsiavummiutut has substantial German influence not shared with the others, for example). 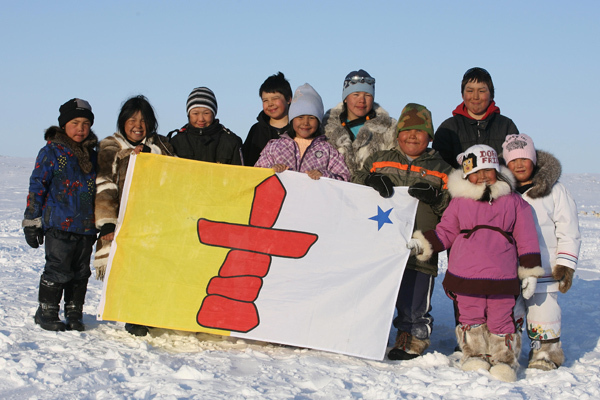 Preserving these languages and their oral traditions into the future will require institutional support, much as Nunavut currently offers to minority Inuinnaqtun, support that may be hard to muster if competition between approximately equally utilized Inuktitut and Kalaallisut standards and English and Danish second languages takes place. All of this becomes more obviously problematic when the non-Inuit but related peoples of Alaska and Siberia, the Iñupiat, Yupik, and Aleut, with their more obviously distinct languages and cultures and links to Russian rather than English or Danish, are considered as well. The eastern North American examples from Nunavut, Nunatsiavut, and Nunavik, at least, are similar enough to plausibly act as regional variants if Nunavut were to absorb its near neighbors, in or out of Canada. (Within Canada, the Inuit actually get more representation in Ottawa by staying separate, thanks to the unusual way territorial Members of Parliament are calculated.) It may eventually be that ascendant Inuit and kin from across the Arctic decide to unite their territories into a single state, much like the East African Federation, but how that process would even begin under present circumstances is beyond unclear. A more interesting complication is that the Language Commission of the Inuit Cultural Institute made the Inuktitut version of Canadian Aboriginal Syllabic script co-official with the Latin script for the languages in its purview in 1976. This script has since been adopted in Nunavut and Nunavik but not elsewhere in the Eskimo-Aleut-speaking world. Arguably, this script is vastly better suited to Inuit phonology than the Latin script, particularly for the family’s trademark long polysynthetic words. A merger would require it to be adapted to other dialects/languages for new populations, discarded despite its popularity, or relegated to minority status. Improved fit to local phonology may not be much of an enticement if it means everyone has to buy and learn new keyboards. By comparison, the eventual future of the Norse territories is far more obvious. Iceland is already independent, and moves in fits and starts toward European Union accession as it recovers from the 2008 Icelandic banking crisis and debates whether the benefits of joining outweigh the potential fallout of the EU’s agriculture and fishing policies. The Faroe Islands are comparably situated to Greenland, but with a smaller population, a currently anti-independence government, and a similarly Eurocentric orientation. Such a tiny state would ordinarily face major problems without massive pre-existing wealth, but the European Union may ease their path, if the Faroe Islands decide to join after leaving Denmark. Another possibility is that the Faroes may simply move their external locus a bit closer. Iceland and the Faroe Islands have extremely similar histories and priorities, and may benefit from a closer linkage. The two becoming a single federated and bilingual state may prove mutually beneficial, not least because it would give both a massively increased fishing range without the international spats Iceland regularly has with Britain over territorial waters. Such a merger would give the Faroes all of the benefits of being associated with a larger state—university access and funding in particular—from a nearer and far more sympathetic neighbor, one that shares its misgivings over EU fishing regulations. Of course, the Faroese do have some important differences from their Icelandic compatriots. The Faroese tend to be more religiously conservative than the Icelandic, to the point of snubbing Iceland’s openly gay Prime Minister at a state function, to universal embarrassment. This is changing—one-tenth of the Faroes’ entire ~50,000-strong population participated in a recent Gay Pride parade—but such conservatism would ill fit with famously liberal Iceland. Similarly, Denmark has received much international opprobrium over Faroese whaling, something neither Iceland nor the European Union would be eager to take up as its own. Either way, the next generation will see major changes to the world map in the western Arctic, a region far too interesting to be so unknown.